ABOVE:Contemporary revival artist C.J. 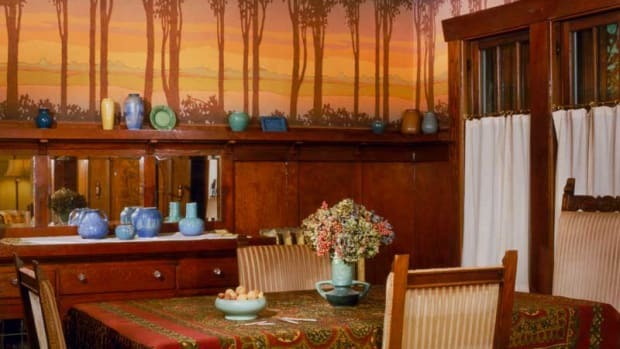 Hurley created an inspired, hand-painted frieze with personal meaning for owners of a 1912 house. First rule (not always, but often enough): Anything But White! Bungalows and other homes of the period make a virtue of quiet, wood-trimmed, womblike interiors. 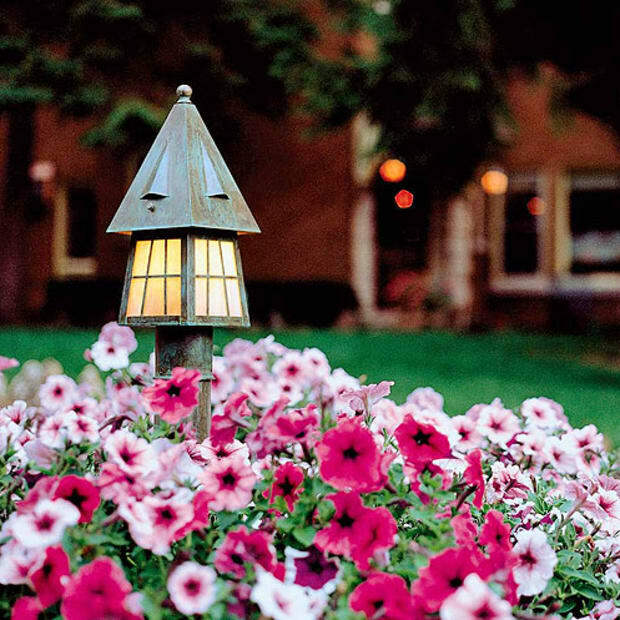 The front porch filters light from the living room. High oak wainscots and beamed ceilings, not to mention low-wattage light bulbs and amber mica lamps, yield a cozy dimness. Learn to love it. If you fight it by painting the ceiling between beams and the plaster wall above the wainscot bright white, you will ruin the architecture. The room will not be appreciatively brighter. But the wood will now read as very dark indeed in what seems a stark, black-and-white scheme. 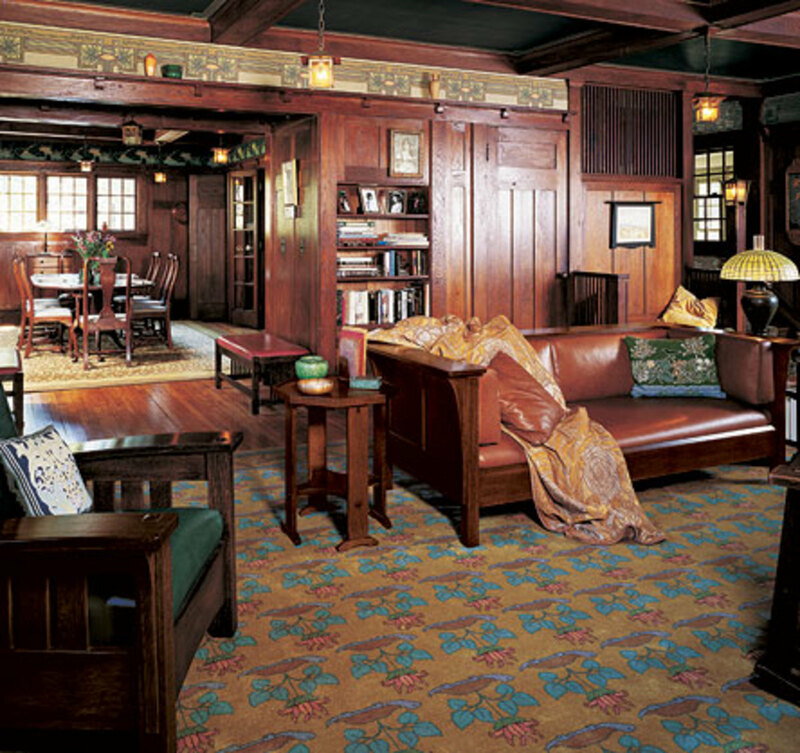 Interior design for an Anglo–American A&C house in Massachusetts, by David Berman, Trustworth Studios trustworth.com. Case in point: The new owners of this splendid old house (ABOVE) inherited white-painted friezes and high-wattage lighting, yet found rooms “oppressively dark.” When designer David Berman told them that mellow colors, carbon-filament light bulbs, and olive-green carpets would bring out the highlights in the woodwork, they were skeptical. After reading up on the Arts & Crafts movement, though, they hired Berman after all. Wallpaper friezes, lighting, and carpets shown are reproductions. Lamps, artwork, and ceramics are antiques. Furniture and textiles are both old and new. The white-painted frieze area and ceiling do nothing for this room except make the beams forebodingly dark. 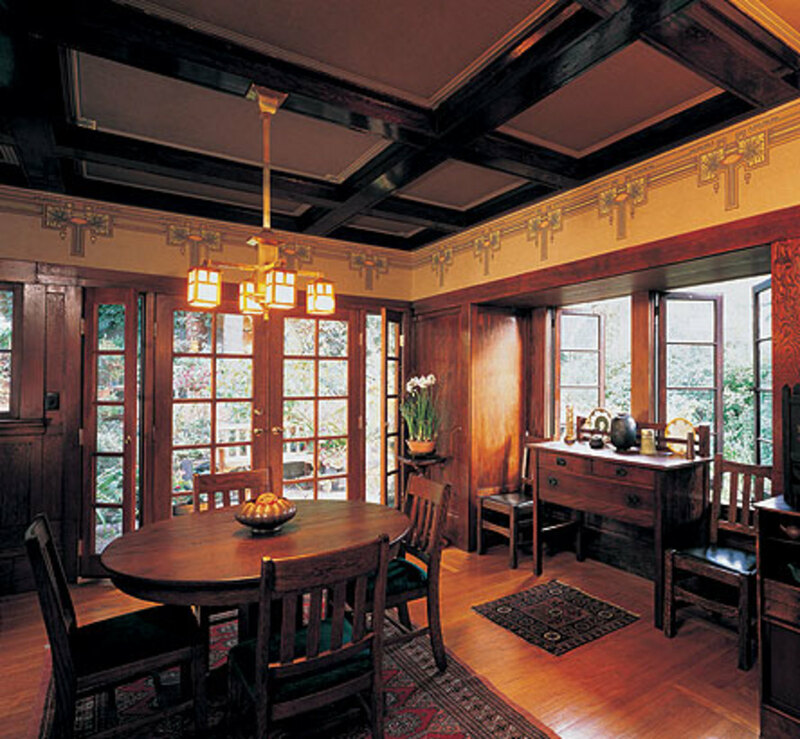 With a warm golden frieze, now the room exudes the Craftsman spirit. Now, as promised, other period treatments. 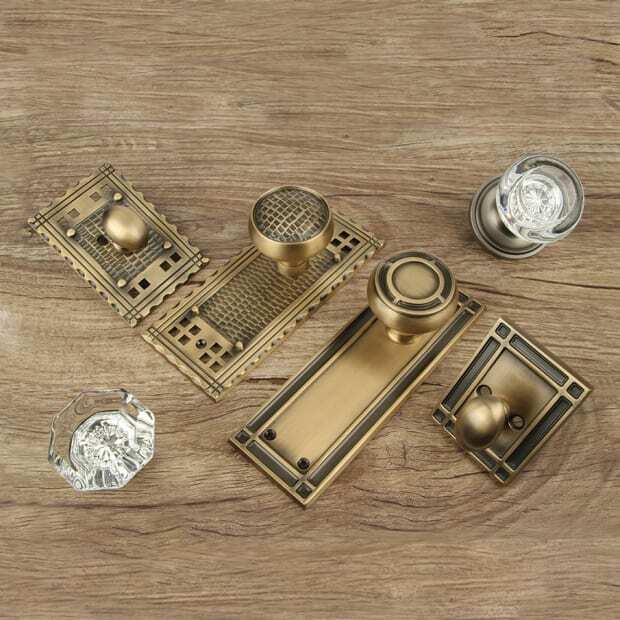 When it comes to decorating walls and ceilings, the Late Victorian and Craftsman periods have been well covered, at least in their revival modes. What of the transitional houses built at the turn of the century, though, and the simpler cottages, and such A&C-influenced houses of the period as Tudors and Spanish Colonials? Queen Victoria died in 1901. 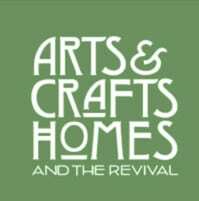 But the era didn’t end all at once, despite the growing popularity of the Arts &Crafts Movement. And it would be some time yet before decorators got busy ripping out cornice moldings, and painting walls and ceilings white. The period referred to in England as the Edwardian era (for King Edward VII, who died in 1910) loosely covers the first two decades of the 20th century in America—right up to the First World War. 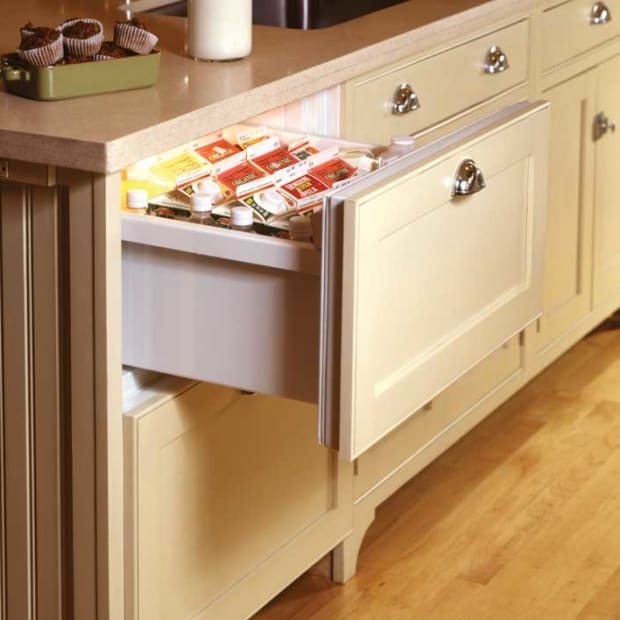 Design influences were many and subtle, and bore trappings of past decades. Wallpapers were still bold and colorful, although the palette had shifted from the muddy tertiary colors of the Aesthetic Movement towards delicate pastels and rich jewel-tones. Olive green became emerald, and the terra cotta and Pompeian reds favored by the Late Victorians were replaced by clear ruby red. There was also more use of blue, a color previously given short shrift. 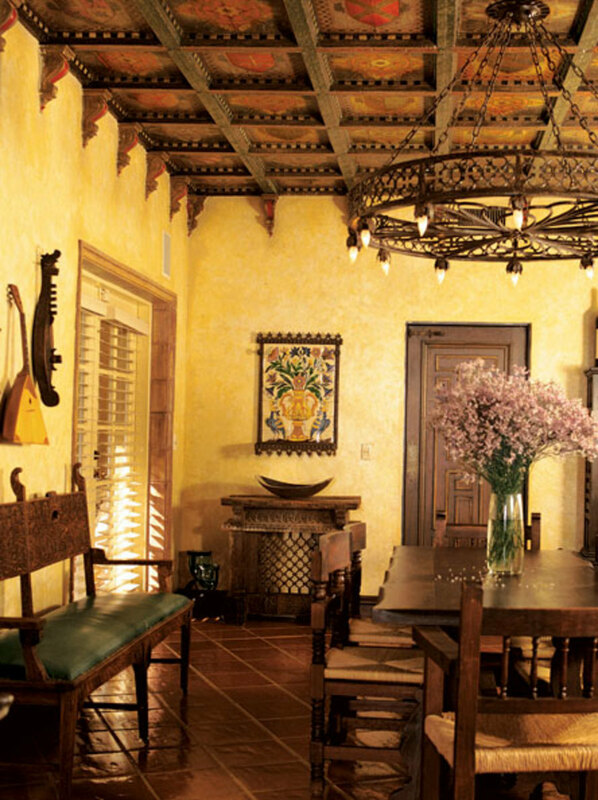 The highlight of this 1925 Spanish Revival Coral Gables (Florida) dining room is the hand-painted, coffered wood ceiling. 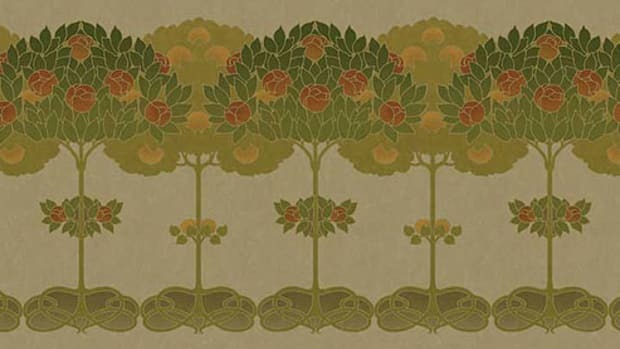 You might choose a wallpaper pattern that undulates for a house of this period, as Art Nouveau was whiplashing around Paris; wallpaper was one of the things affected by that movement on these shores. Geometrics were out of style, florals and sinewy lines all the rage. But you, like so many before, may prefer Art Nouveau’s archrival, the Colonial Revival. Patterns in this mode drew inspiration from a previous century but were produced in a smaller scale and with less bold motifs; look for delicate neoclassical patterns. Still other wallpapers from this era simulate fabric or textured plaster, in a nod to the Arts & Crafts Movement. These were printed on oatmeal ground, a slightly lumpy paper, or they had an overlay print that simulated tapestry or burlap. (Tapestry and oatmeal papers are available again; see listings here. Paint was also a popular treatment for walls, often applied over textured or troweled plaster, or embellished with pin-striping or moderate stenciling. Ceiling papers still appeared for the first decade of the century, but fell from fashion after the 1920s. Ceiling treatments are, of course, very much in vogue in today’s Arts & Crafts Revival. 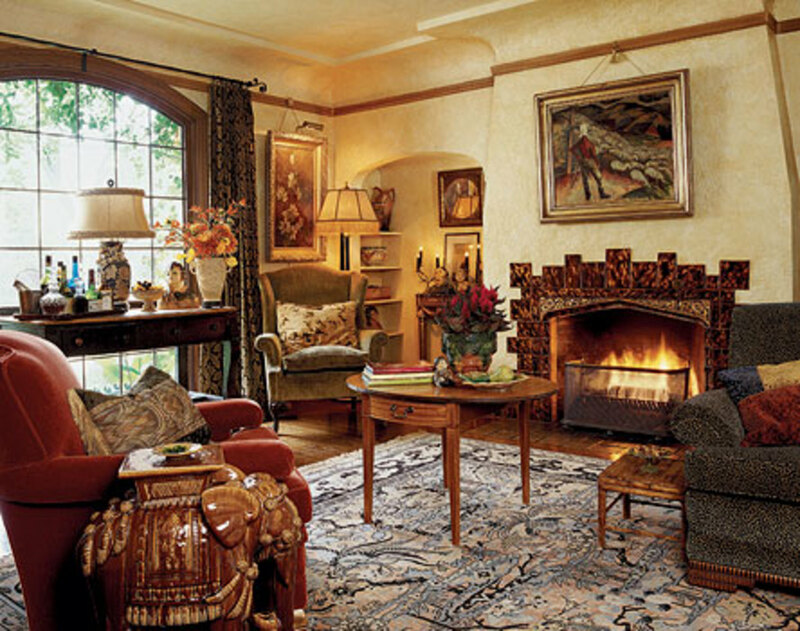 The interior of a 1929 English Tudor cottage has been made lush in the style of 1930s Hollywood: texture abounds in troweled walls, velvet fabrics, and fireplace tiles painted in faux tortoise-shell. Note the coved plaster frieze between walls and ceiling. It was during this time that an interesting trend developed in the treatment of the transition from wall to ceiling. 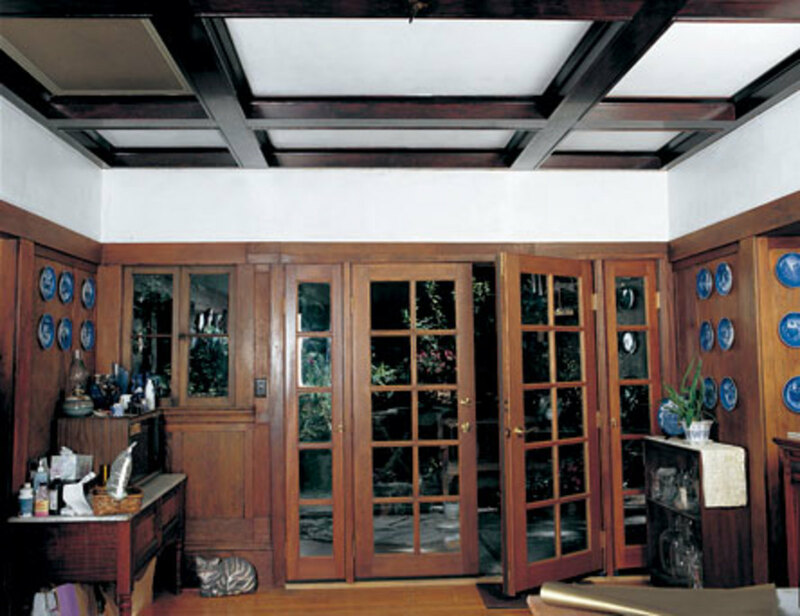 During the Victorian era, the junction between wall and ceiling planes was finished with a molding, whether a built-up crown mold or a simple picture rail. During the Edwardian era, it became fashionable to lower the picture molding anywhere from nine to eighteen inches below the ceiling. This created space for a stenciled or papered frieze. Nevertheless, the plastered top of the walls was usually painted the near-white color of the ceiling. Or it was painted darker, or pinstriped. There was a vogue for coved ceilings, too, popular in houses of various styles from neoclassical to Tudor or Spanish. A concave arc of plaster formed a seamless transition between wall and ceiling, with no right angle. It might be treated, decoratively speaking, as part of the ceiling or part of the wall, for different effects. The cove might be ornamented with applied plaster in a “wedding cake” manner, often with Adamesque swags and wreaths, and the decoration could carry over to the ceiling. After the War, there was a sea-change in interiors. 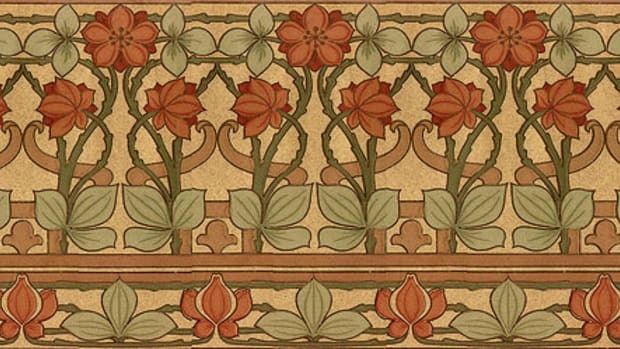 Wallpaper was still being printed, but the Arts & Crafts Movement had paved the way for the Romantic Revivals, most notably those of the Tudor and Mediterranean styles, which had been quietly lurking in the cupboard since 1900 and were now sweeping through the suburbs like an architectural brushfire. Suddenly, it seemed, every wall (and many a ceiling) had been troweled with rough or textured plaster. The idea was to lend a romanticized impression of age and patina to a modern interior. Appropriate textures range from a plain sanded surface to something one might call ‘Volcanic Crater’! Ceilings were not universally monochromatic in houses of the Romantic Revivals. In fact, highly decorated ceilings with wood coffers, colored stains, and stenciling were used in Mediterranean houses, and Tudor Revivals had heavily beamed or coffered ceilings, or Jacobean plaster ceilings with intricate tracery. Libraries, dining rooms, and halls had painted panels with medieval or Tudor motifs, often with dull blue or Venetian-red accents. It’s rare to find a period example that hasn’t been over-painted. But careful analysis will reveal such treatments. A great place to go for inspiration: the restored lobbies of those grand hotels built during the 1920s.